Why upgrade to the FELIX Pro 2? One hot-end for both sides lowering the total cost of ownership. The filament detection sensor (changed from inductive to an optical high precision encoder wheel). This resulted not only in better and more reliable filament detection but also a drastic improvement in print quality due to the more constant filament flow. Improved airflow of extruded filament improves 3d print quality, especially for 3d prints with overhanging parts..
x-axis idler pulley design changed for smoother motion and better long term reliabilty. Several small improvements in assembly add up to an improved overall performance. Full checkup of your machine. When we or one of our authorized resellers perform the update, the machine will be fully checked and brought to the latest assembly standard we have at FELIXprinters. The FELIX Pro Series are all about Plug & Play. Besides a good working machine, the software is just as important. 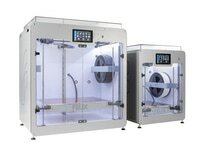 To get the most out of your FELIX, we have teamed up with Simplify3D. The best in class software solution available today. The Upgrade Service enables you to benefit from the most recent upgrades without the hassle of installing upgrade kits yourself. Your FELIX will be maintained and upgraded to the most recent version by FELIXprinters professionals at our office in IJsselstein, the Netherlands. Currently there are serveral options to get your FELIX to the FELIXprinters office in Utrecht. You can always send your FELIXprinter yourself to our office in IJsselstein. We will schedule an appointment with you first to install the upgrade so it takes as little time as possible. We can arrange the return to you by UPS or you can collect the printer yourself at our office (only by appointment). Pick up of the printer will always be done by UPS. We have very good experiences with UPS and it allows us to set an exact date for pick up and delivery. 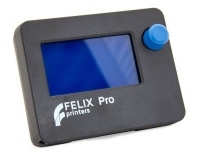 Customers from other countries who would like FELIXprinters to upgrade their FELIX, can send in a request. We will send you an offer with shipment costs and then you can decide if you accept the total price.